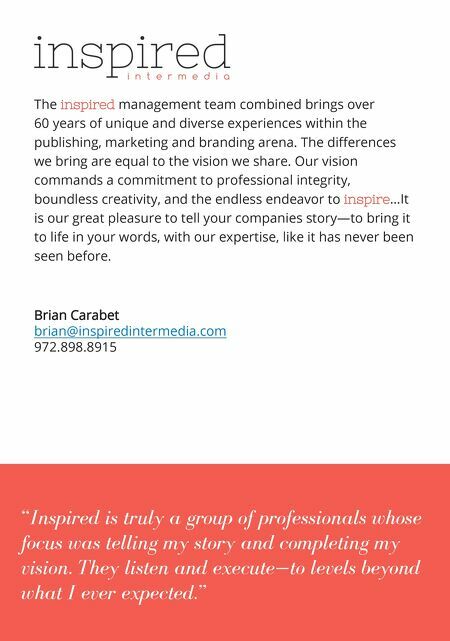 The inspired management team combined brings over 60 years of unique and diverse experiences within the publishing, marketing and branding arena. The differences we bring are equal to the vision we share. Our vision commands a commitment to professional integrity, boundless creativity, and the endless endeavor to inspire…It is our great pleasure to tell your companies story—to bring it to life in your words, with our expertise, like it has never been seen before. Brian Carabet brian@inspiredintermedia.com 972.898.8915 Beth Benton Buckley beth@inspiredintermedia.com 954.296.3274 Doug Kawakami doug@inspiredintermedia.com 301.524.0163 Visit us. "Inspired is truly a group of professionals whose focus was telling my story and completing my vision. They listen and execute—to levels beyond what I ever expected." "Inspired Intermedia's combination of a printed book and interactive digital book is powerful tool in the marketing of my brand…I truly feel I am getting more than what I paid for. "